How great is this chat? I found it on Pinterest when I was looking for printables for my Home Management Binder (blog post coming soon) and feel like I need to tape it on my fridge as soon as I get back to Sicily. I'm sure the whole house cleaning process as outlined here would take me several hours the whole day, but having it streamlined like this would help me move quickly from task to task. 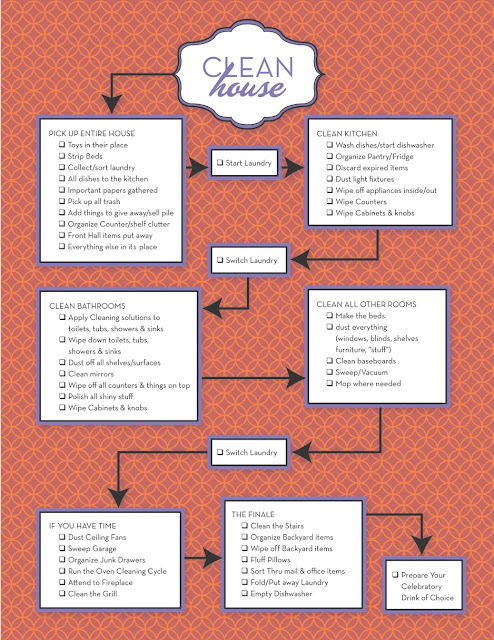 I'd love to hear your favorite house cleaning or home management tip. What do you do to keep a quiet, clean home? "I would have laughed at that expression before, but now I am convince it is an art..." Me, too! Becca, what a great find on Pinterest! Although I am too ADD to do the entire chart in one day, maybe just picking three items from each of the boxes everyday would help me stay focused. :) Loving your blog! Hope you have a great weekend. This chart is just what I needed today! We are hosting a party tomorrow night and I have not done any cleaning, so I'm blitzing it tonight!! This will help me stay on track, I think :) Miss you, friend! Looks like you've been having lots of fun! Nikki, this is just what my mom did too! We called them "Saturday Morning Jobs" or SMJs, and we did them every Saturday from about age 4 until we left the house for college. Now, just like you, I try to do a few tasks each day, and it works better so that I can have the weekends to relax with my whole family together (or at least all 3 of us, haha) in a fresh, clean house. Oh that chart is so cool, thanks Becca! I actually printed it out and went through all the tasks that applied to me. (I didn't do the "If you have time" part.) From start to finish, including minor interruptions from my two boys, it took me 2 hours. Not bad, because I have the rest of the day to have fun with them! The only glitch I noticed for using the chart in my own family is that I got the various boxes done before the laundry was actually ready to be "switched." So I am technically done with all the check-off boxes, but only on my second load of laundry (with mountains more to do.) So if I can find a way to modify the chart to fit my laundry style, this will be a definite "go to" in my daily chores. Wow, it only took you 2 hours?! And it's only 10:46am when you're commenting? You're a rockstar, Stacie! I love this chart! Like you, it would take me all day! And I normally divide tasks throughout the weeks and always save some for the kids on the weekends. But like you said, this is a great list to keep me moving when I'm not sure where to start or where to go next!